The Watergate scandal erupted after it was revealed that President Richard Nixon and his aides had engaged in illegal activities during his 1972 reelection campaign--and then attempted to cover up evidence of wrongdoing. With impeachment proceedings underway against him in Congress, Nixon bowed to public pressure and became the first American president to resign. At noon on August 9, 1974 Nixon officially ended his term, departing with his family in a helicopter from the White House lawn. Minutes later, Vice President Gerald R. Ford was sworn in as the 38th president of the United States in the East Room of the White House. Concerned by the number of questions regarding President Nixon that came up during his first press conference on August 28, President Ford asked his White House Counsel Phil Buchen to quietly look into legal precedents for Presidential pardons. Benton Becker, a lawyer who had been involved in preparing for Ford’s Vice Presidential confirmation, assisted with the research. President Ford also talked to several key aides: Chief of Staff Alexander Haig, Secretary of State Henry Kissinger, and Counsellors Robert Hartmann and Jack Marsh. Due to the sensitivity of the topic the discussions were a closely held secret. After considering all of the research and opinions gathered, on September 7 Ford made the decision to pardon the former President. 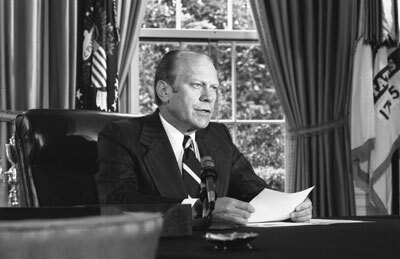 On Sunday, September 8, 1974, President Ford addressed the nation from the Oval Office to announce his decision to “grant a full, free and absolute pardon unto Richard Nixon for all offenses against the United States which he, Richard Nixon, has committed or may have committed.” President Ford noted in his remarks that the pardon reflected both his Presidential responsibilities and his personal beliefs. Shortly after the announcement former President Nixon released a statement accepting the pardon. Although such a statement wasn’t required President Ford felt it was very significant. By resigning and accepting the pardon, Nixon was publicly acknowledging his guilt in the Watergate cover up. The public’s reaction to the announcement, however, quickly proved that the pardon had not settled matters as President Ford had intended. The most immediate consequence was the resignation of White House Press Secretary Jerald terHorst shortly before the announcement was made. The President had told him of the decision only the day before and terHorst felt he could not support it. The White House received thousands of letters, telegrams, and messages in the days following the pardon announcement. Reactions ranged from outrage to support. Government officials, celebrities, and citizens from around the country all weighed in with their opinions. Many felt that the pardon continuined the Watergate coverup by preventing the possible indictment of the former President that could have provided answers to lingering questions. Among the overwhelming negative responses from the public was the idea that the pardon was part of a “secret deal” between Ford and Nixon. Several Representatives requested answers to specific questions regarding the pardon and the circumstances surrounding it. On October 17, 1974, President Ford appeared on Capitol Hill before the House Judiciary Committee’s Subcommittee on Criminal Justice (Hungate Committee), becoming the first sitting President to give sworn congressional testimony. He delivered an opening statement and answered questions posed by the committee members regarding when and with whom he had discussed the pardon, and why he decided to grant it.